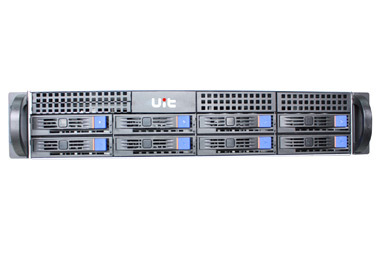 SCS1000 series products are based on the domestic Shenwei 64-bit multi-core high-performance multi-core processor completely self-controllable, efficient and easy to use secure storage system. SCS1000 is a series of products based on domestic Shenwei high performance 64 bit multi-core processor is fully self controlled, secure storage system, easy to use, support enterprise NAS function, is the first domestic storage system based on CPU, is widely used in many application fields in government offices, military, aerospace, defense education and industry users. 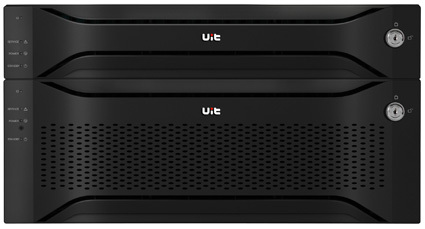 SCS1000 series of products equipped with domestic Shen Wei high performance multi-core processor, equipped with independent research and development of UStor storage system innovation, with the core device to the storage system software completely independent intellectual property rights. 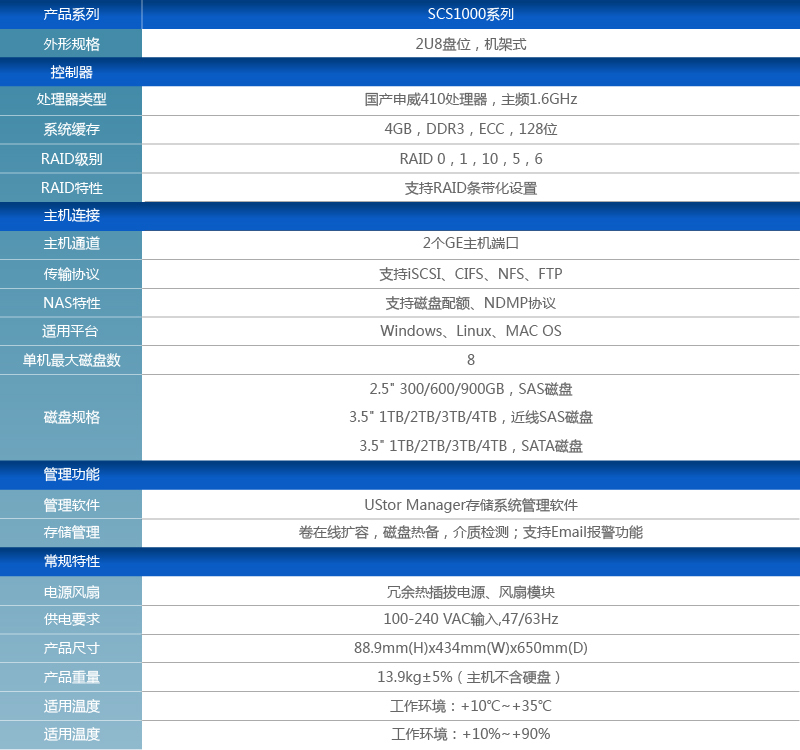 Shenwei high performance multi-core processor using symmetric multi-core architecture and SoC technology, single chip integrated 4 bit RISC structure 64 Shenwei processor core, 128 bit DDR3 memory controller and two sets of PCI-E standard I/O interface, the maximum operating frequency of 1.6GHz. SCS1000 series of products to the overall architecture design meet the application requirements of 7X24 enterprise, and from the main control board, power supply, disk management to data access security control many aspects of the enhanced security, ensure the security and reliability of system. The system is equipped with 1+1 redundant power supply, the main control board uses SMT surface mount technology, strengthening the heat conduction aluminum alloy cold plate heat radiation, the whole structure is compact, and the vibration impact strength is high. 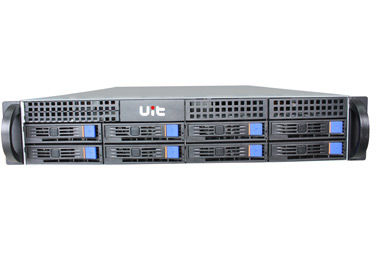 The system supports RAID0, 1, 10, 5, 6 and multiple RAID level, ensure data integrity and access in some hard disk failure, while the system supports local users, domain users, anonymous users three kinds of access control, enhance the security of data access. SCS1000 series of products using the domestic leading domestic Shenwei high performance 64 bit multi-core processor, PCI-e2.0 bus, 6Gb SAS2.0 system wide port with 64 UStor storage operating system high-speed transmission technology, to enhance the processing ability of the system, to achieve the high performance file read and write. 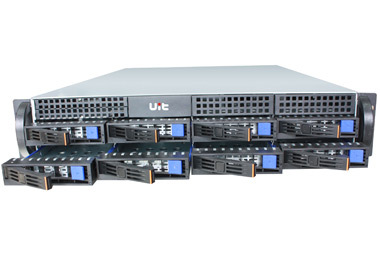 System uses energy-saving design, compared to the traditional x86 system architecture energy saving about 30%, so as to obtain high performance and low power investment returns. SCS1000 series of products using management graphical intuitive, easy to manage, the configuration is simple, convenient, and support message alarm function, can realize remote network management and automatic email notification of failure, effectively reduce the user cost of management and maintenance and storage system of human input.